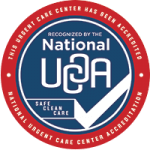 This October, Advanced Urgent Care is proud to participate in National Breast Cancer Awareness Month. Breast cancer is the second most common kind of cancer in women. About 1 in 8 women born today in the United States will get breast cancer at some point.